Due to its length and occasional gradient, this walk is considered quite challenging. Starting with a lovely little trek out of the main village settlement, along the side of Carnon River before emerging out onto Station Road and moving in a northerly direction towards Blackwater, after about 100 metres the walk takes you down a bridleway to the right and towards the Jolley’s Bottom area. Passing one of the old water “top up” shutes (see Pathe News clip of Chacewater in the late 40’s early 50’s) be aware to spot the orange arrow in the thicket that eventually navigates you right, up and over the main London to Penzance railway crossing – keeping your eyes sharp and ears open for trains obviously! Do dwell a pause or two along this narrow tree tunnelled route and find a gap in the hedge to check out the agricultural landscape that now surrounds you – it is lovely and really worth seeing. Once over the railway line, continue straight onward for a few hundred yards, then turn right on and up towards the Kea Downs “ridge” road. Turn left at this point for straight half mile trek along the road (stopping occasionally to take in the distant views afforded from this plateaued space) to a point just before the main A30 flyover, where you will turn left. 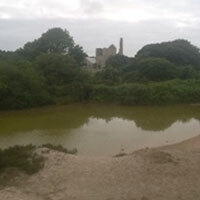 You then descend about another third of a mile eventually coming out onto a crossing at Station Road, at the centre of a partial wetland which is an officially designated Cornwall Wildlife Site (CWS). About half way now (you could turn left towards Chacewater if you choose!) at this point you cross straight over Station Road and up towards the wooden sided railway bridge, catching a glimpse of the 7-Arched Viaduct to the left as you go. 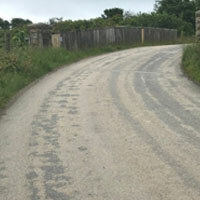 Over the bridge, you then take the next left turn at a bit of cross roads along this rural road. 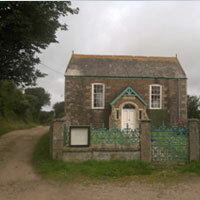 Stop before you do though and consider taking a slight 100 metre detour to the right along the Devoran to Portreath cycle route and visit the Grade II* Listed Chapel at Wheal Busy (1863), which has a rarely preserved original interior. Returning to the crossing, go straight over and then take the next right down and out onto the Great Wheal Busy Down area. Turn left along the tree tunnelled lane at the end which you can see a metaled gate from where you can see the real majesty of the surrounding countryside and glimpse both railway viaducts in the distance that bisect the valley bottom. Be sure not to miss the two white domes in the field to the left that identify the now abandoned Observatory for Cornwall Astronomical site, which it is will be gradually brought back to life by a few caring volunteers. Turn right and right again as you come down through the Downs and eventually link with the Wheal Busy Lane; turn left at the large boulders for another half mile trek back into the main settlement of Chacewater. On this occasion you turn left at the Terrace and then take the first right down Sergeant’s Hill, which takes you out onto the busy High Street, which you cross over, nip along Falmouth Road and finally see the Square Car Park once more. Parking – The main Chacewater village Square Car Park behind the Kings Head pub. 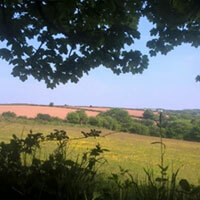 Picnic Areas – The nearby Chacewater Millennium Green before or after your walk, although some have been seen sitting on blankets on top of Great Wheal Busy Downs on occasion. Eating and Shopping – Along Fore Street you will find a couple of traditional village shops, the Old Market (Fruit, Veg, seasonal plants and Deli) for coffee, a local Bakery and our own Fish and Chip shop. Family and Children Friendly – Whilst very rewarding, this is a bit of a trek for the less hardened walker (not really pram friendly either!) and includes the often very busy Kea Downs “ridge” road. You can always go so far though and make a return journey or do it in several stages. 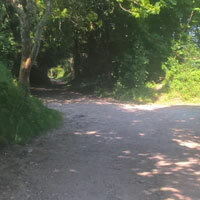 Cycle Trail – Yes, but be aware of pedestrians and specifically the bridleway descending from the Kea Downs to Station Road because it can get quite tricky under wheel in places. 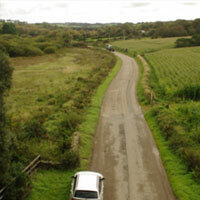 Horse Riding Trail – Recommended in parts only, because of the narrow paths, metalled roads and railway crossing. 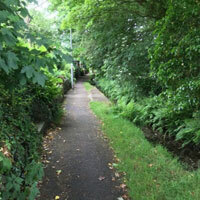 Walking Trail – A good lengthy challenge, good boots are certainly the order of the day unless it is very dry underfoot. Disability Access – Definitely not recommended for scooters or any one with difficulty walking. The pathway at the Carnon Riverside is a little gem, beside which sits a series of old cottages that allow the imagination to take you back to how life once was in mining times. 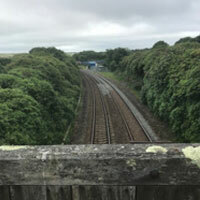 The Cornwall Wildlife Site (CWS) to the left of this view from on top of the A30 underpass is to your right as you emerge out onto Station Road and needs to be seen. At the half way point of this walk, this part-wetland area provides a significant natural habitat for local wildlife and vegetation.